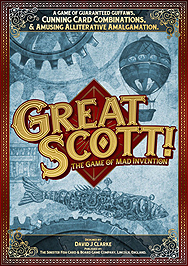 Build the greatest inventions never known in this easy to learn, fast paced card game. Construct an amazing machine using Asset and Concept cards, and then explain how it works! Will you go for the high scoring cards, or play it for laughs and be showered in commendations from your fellow inventors? With over 95 million combinations, you'll never play the same game twice!